Confused about choosing your new bed? Buying a new bed or mattress is not something most of us do very often. It's easy to get overwhelemed by the sheer quantity of information available. With the vast number and variety of products, how do you find what's going to give you the best night's sleep? Deciding which bed or mattress is the most comfortable for you is a very personal thing, and something only you can discover for yourself by actually lying on some. More than 40 beds and mattresses to try. Plenty of hassle free time to experience the different beds available. Over 30 years experience advising customers. Well worth a few minutes to browse through. Perhaps you're wondering what pocket springs are? Maybe you've heard about memory foam but don't know what all the fuss is about? Just want to feel better informed before visiting a store? A read through this useful guide will help you know if you've been given sensible advice. You can pick this leaflet up from our store. Alternatively, a click on the image will take you to the NBF site to read the guide online. 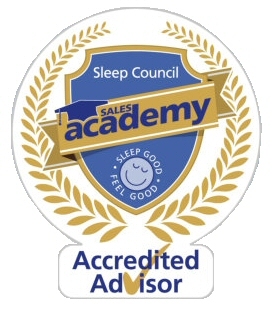 An independent research organisation with loads of useful advice to help you slepp better.